Variable speed lathe is compacted variable speed mini hobby lathe used to process materials into a new object. Its main components include the headstock, bed, feed and leadscrews, carriage, cross slide, compound rest, tool post, and tailstock. 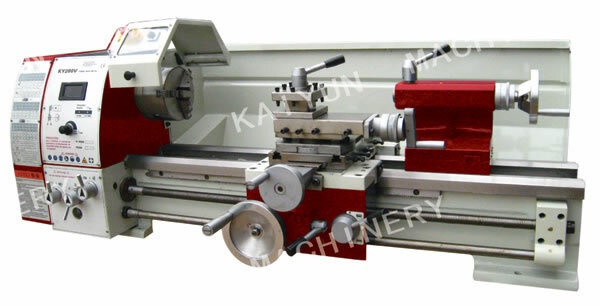 Kaiyun Machinery Company is a professional supplier of variable speed lathe based in China. A variety of types variable speed lathes, such as KY180V, KY210, KY250V, and KY280V are provided. These environmental friendly variable speed lathes are purchased from renowned manufacturers. Made by adopting advanced technology and with the efforts of our experienced technicians, they are of high quality and are all CE certified. Hence, you can feel secure in purchasing and using our variable speed lathes. In addition to offering good quality other products, we also attach great importance to after sale services. We can assure you that any complaint or problem about our variable speed lathes, variable speed wood lathes, variable speed mini lathes, jet variable speed lathes or other products will be replied and solved within 24 hours. Due to the high quality and low price of our products and our courteous service, our variable speed lathes and some other products are successfully sold to many countries, especially in Europe and America. You are welcomed to inquiry or purchase our lathe products at Kaiyun Machinery Company.